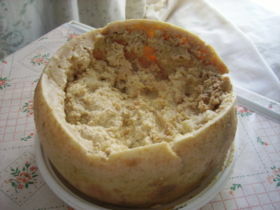 Last night's F-Word featured probably the most disgusting cheese in the world: the casu marzu. This is a sheep's milk cheese from Sardinia, Italy that is effectively a Pecorino Sardo, but taken a stage further in the fermentation/maturation process. After a couple of weeks of maturation, the top of the cheese is cut open and the cheese is left open for the flies to get at it. Yes, the flies; and this is intentional. Once the flies get in, they lay eggs which then grow and become larvae which eat, digest (and poop) the cheese. This turns the cheese from a hard cheese to a pungent soft cheese with live wiggly worms in it. Apparently some people eat the cheese with the worms in, and others like to remove them first, but a sure sign that the cheese is good to eat is the worms are still alive. I'm quite a fan of cheese, but I don't think I'm brave enough to try this one.